Three students in the medical office program at the Mingo Extended Learning Center competed at the West Virginia PBL State Leadership Conference, which was held April 5 at Fairmont State University. Students may compete in two events each. 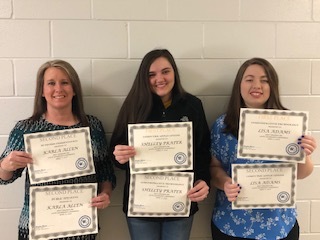 All three students earned either first or second place in both of their events, which qualifies them to compete in the National PBL Leadership Conference in San Antonio, TX from June 24-27. Pictured from left to right are: Karla Allen, Shelley Prater, and Lisa Adams. The April TASC Test test is currently scheduled for April 23-24. Please contact Josh May at SWVCTC for the Adult Basic Education classes to be eligible to be scheduled for the exams. His number is 304-235-2022. The final date for the LPN Entrance Exam Testing will be April 11. If you are interested in applying for the LPN program for the 2019-2020 school year you must have earned the 11th grade level on the TABE test, have a passing score on the LPN Entrance Exam, and completed application by the final test date. Contact Josh May at SWVCTC at 304-235-2022 to schedule the TABE. Instructors will begin scheduling interviews for potential students on April 12, 2019. Please call 304-475-3347, ext. 16 for more information if you are interested in becoming an LPN.